First recording, from a BOB (Brothers of Blood) concert. B.O.B. is a Mauritania hip hop group that now lives in France. They arrived to a screaming crowd at this homecoming gig. Ibrahim Boucoum, Malian guitarist in Sekou’s studio does a bit of “griot” improvisation, a “freestyle” (in french). He asks my name and then proceeds to sing about myself and America and Obama (you don’t need to speak French to understand that much). He is joined part way through by “Nasty”, an R&B; singer. Abdoul “Baby” Sarr is one of the greater guitarists in Nouakchott. I visit him with his band via an introduction through a friend. Most of the group has been playing for some time, 30 years plus, notably Baby and his friend Jawara (the soloist). The three guitarists and percussionist play a few songs in Soninke, Pulaar, and Hassaniya (listen for the breakdown in the first track), a mixture of Reggae, Funk, and traditional sound. Finally, a rehearsal session for an upcoming concert. The band is led by Sidi Baba, the singer, a flamboyant reggae rockstar, joined by myself and Boucar on the guitar and Khadim on Djembe. 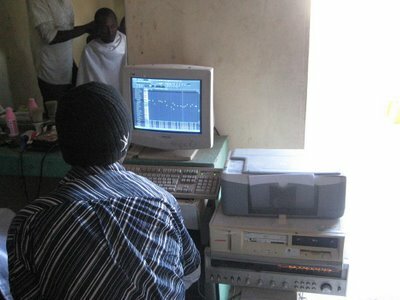 This track uses a traditional Pulaar folk song, but much of Sidi’s music is strongly influenced by Baye Fall, one of the Marabout brotherhoods in Senegal.